Villagers in Yogyakarta, Indonesia needed a community space for their daily meetings but had little money or resources. So bamboo specialists Andrea Fitrianto and Jasri Mulya worked with non-profit Architecture in Development to create a sculptural space from fast-growing black bamboo. The new Black Bamboo Community Center is airy, super strong and built on underutilized space between two houses. 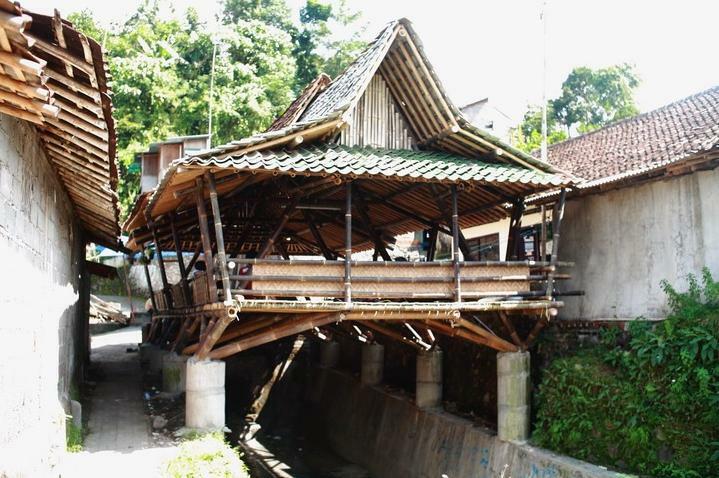 The Black Bamboo Community Center in Kampung Pakuncen, Yogyakarta, was built on stilts on top of a drainage channel and in-between houses. Locals and bamboo specialists worked together to construct the center earlier this year. The gorgeous new space is made entirely from local black bamboo (Gigantochloa atroviolacea) assembled with steel screws and mortar joints. The ‘wonder grass’ is a renewable, long-lasting and very strong plant – and unlike wood, harvesting the material doesn’t kill the plant but makes it stronger and more productive. The total cost of the bamboo shelter was only $2,500, and it was covered by locals and housing rights associations. The Black Bamboo Community Center is a great example of climate-proof architecture – it’s cool and airy in hot weather, and its elevated position makes it immune to flooding.